Older cemetery memorials and markers began by giving simple information: a name, a date of birth and a date of death. Persons of wealth could add more information. The stone cutter’s craft was slow, painstaking and expensive. Over time more art, symbolic and otherwise, was added. 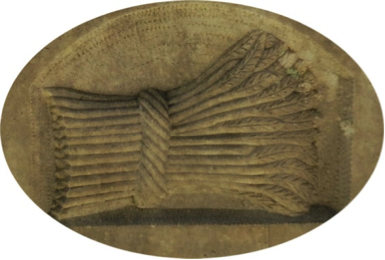 Understanding the meaning behind a bundle of wheat, clasped hands, or a Masonic square required some basic knowledge of religious or fraternal symbols. With the recent advent sand or programmable laser carving, more complex and personal choices are available. So instead of that bundle of wheat you might see a University of Florida Gator. Though perhaps not as graceful, the gator is certainly easier to decipher. Evergreen is also home to some unique and personal grave markers of local interest. 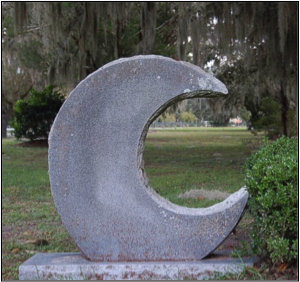 The first is in the shape of a foot and the second is in the shape of a crescent moon. 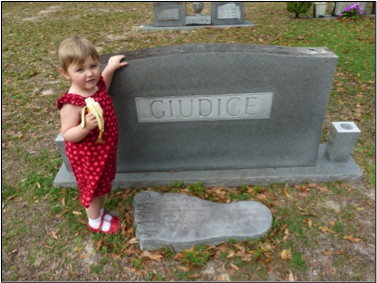 The foot stone belongs to Dr. Robert Giudice, a Gainesville podiatrist for many years.